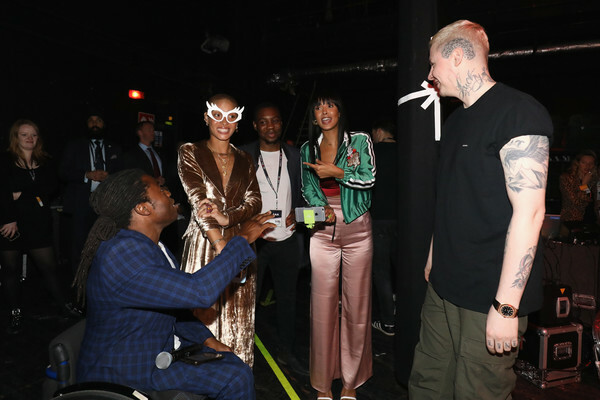 (L-R) Ade Adepitan, Adwoa Aboah, Henrique Wooding, Maya Jama and Professor Green backstage as thousands of Global Citizens unite with leading UK artists industry leaders, and non-profit organizations for Global Citizen Live London, at the O2 Academy Brixton on April 17, 2018 in London, England. The event took place to hold Commonwealth leaders accountable for progress made towards achieving the Global Goals for Sustainable Development and ending extreme poverty by 2030. They used their collective voice in a bid to be the generation to end extreme poverty at the free-ticketed event in Brixton.